When two friends, Cat and Mouse, go outside one day to play in the green meadow, they are very surprised to find snow instead of grass. Together, they discover the fun of playing in the cold, white snow. 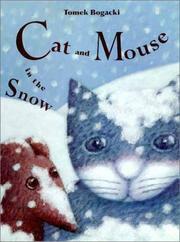 Bogacki, Tomacz, “Cat and mouse in the snow,” Children's Picture Book Database at Miami University, accessed April 24, 2019, https://dlp.lib.miamioh.edu/picturebook/items/show/6892.